Serve up this Manhattan Clam Chowder with bacon, potatoes, clams, in a tomato-based broth. Stay nice and warm with this cozy and comforting clam chowder. Pair with a buttered roll or a crisp salad and dive right in. If there is one thing I love, it is a good clam chowder. I just made New England Clam Chowder and thought I’ve never tried it before so I was interested in seeing what it would taste like and how it would compare. The ingredients are quite similar to the New England version, but instead of cream, it’s made with tomatoes. If you are a fan of tomatoes, you will like the twist to a classic New England Clam Chowder. I was impressed with the flavors of this chowder. The tomatoes offer a nice acidic element to the chowder that you don’t get with the creamy based chowder. 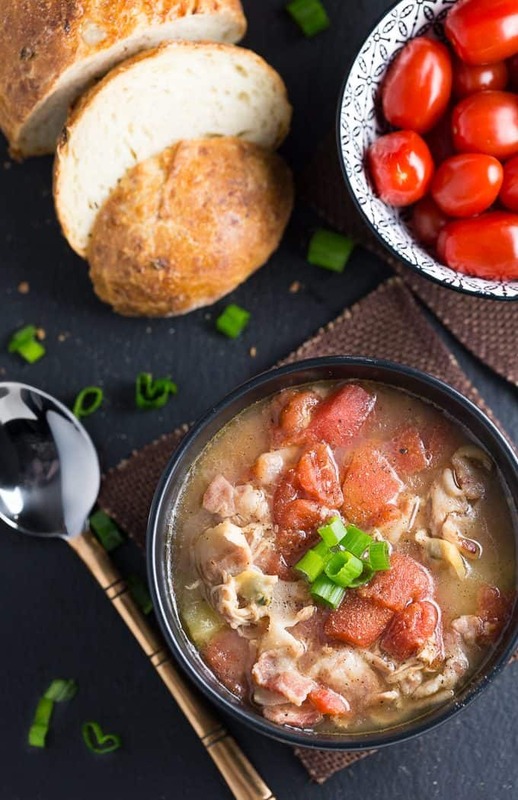 Manhattan Clam Chowder is well known with red broth from the tomatoes. It makes it unique and different in color. Often chowders will be extra thick and creamy and made in a white sauce. 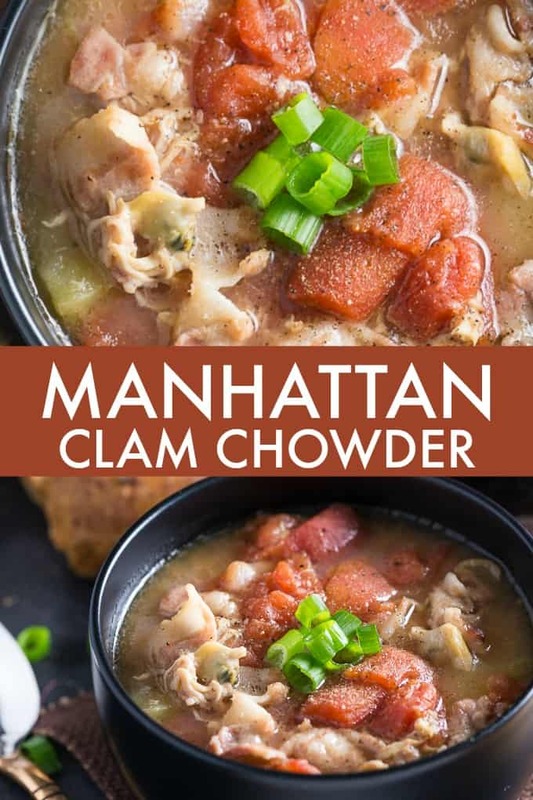 While Manhattan Chowders use tomatoes as the base, it is still classified as a chowder. You will see a lot of kinds of seafood being called chowder as that is what fishermen would make years ago. 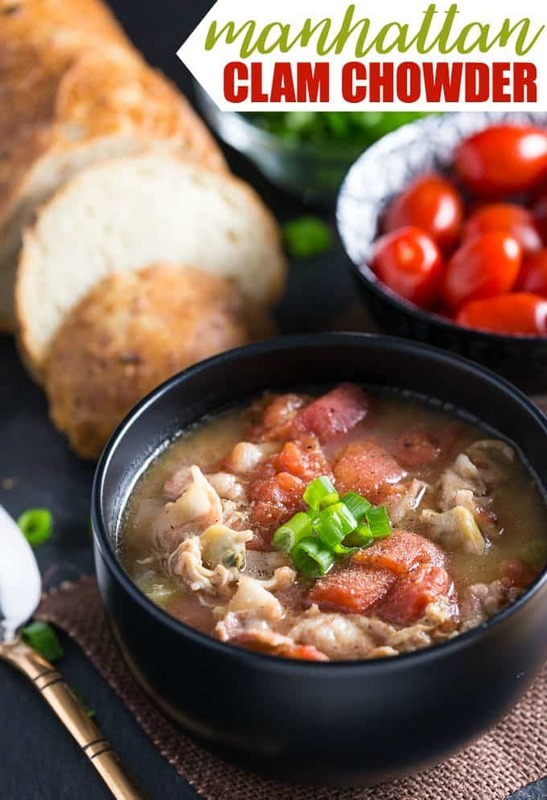 Manhattan Clam Chowder is an incredible chowder to whip up. You only need baby clams, bacon, diced tomatoes, potatoes, and a few spices. With a little prep and cook time, you will have one hearty bowl to ladle up and feed your family or even a crowd. You are welcome to double this recipe or even triple. Just grab a large pot and follow the recipe as directed. I have no issues with increasing the recipe in the past to serve a larger family or crowd. You will need potatoes, can of diced tomatoes, two cans of baby clams, bacon, onion, and thyme. Cook your bacon and onions until they are sweating over medium heat. Mmmm smells so good! Add in the clams with their juice, water, and diced potatoes and bring to a boil. Next, simmer your chowder on the stove top for around 20 minutes. Add in the can of diced tomatoes (undrained) and thyme and bring to a boil again. Once it boils, it’s ready to serve! Serve with a buttered roll and salt and pepper to taste. Clams are a mussel that offers a mild taste. They also offer a salty taste, that is not overpowering like some seafood is. Clams can be eating cooked or raw, and provide a delightful flavor. When you pair it next to the bacon, potatoes, and tomatoes, it helps bring out a lot of flavors. This is one satisfying chowder. Manhattan and the famous New England are the two main clam chowders. Many people prefer New England as it is a creamy texture, and Manhattan is tomato based and a thinner style broth. You will begin to see that when you travel across the globe, different areas will serve up different types of chowder. Clear broth, creamy and thick, served in bread bowls, and more. Each state has its version of chowder that is their tried and true. Many top restaurants use canned clams shockingly! You are welcome to use canned or use shelled clams if you would prefer that. I love the ideas of shelled clams for a stunning presentation, but canned clams taste just as good! Top with some oyster crackers or serve with saltines and dive in. Each bite will be a flavor explosion of salty, smokey, acidic and more. This chowder is a savory dish for sure and will leave you coming back for seconds. I prefer the New England Clam Chowder, but the Manhattan version is still tasty! Which one do you prefer? So tasty! Filled with baby clams, bacon, potatoes and tomatoes. In a large pot, cook bacon and onion over medium heat until bacon is crisp and onion is tender. Stir in clams, potatoes and water and heat to boiling. Reduce heat. Cover and simmer 15 to 20 minutes or until potatoes are tender. Oh boy does this look delicious! I love the fact that it’s not the traditional creamy clam chowder as I am watching what I eat. I can’t wait to try this! I’ve always been curious to try this. The recipe sounds outstanding! Pinned! 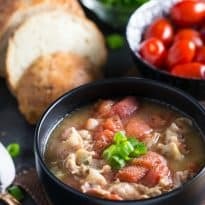 I’ve never had clam chowder but this recipe looks absolutely amazing! Thank you for sharing at Merry Monday! I love clam chowder but, haven’t had it in a long time. This sounds fantastic and of course, bacon 😉 Thanks for sharing with us at Funtastic Friday!